How to Get from Lisbon Airport to Praia del Rey? 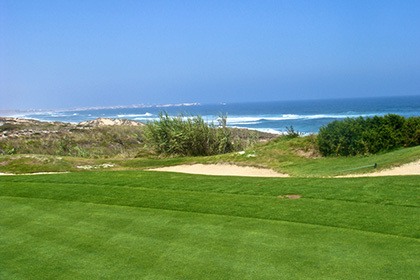 If you are planning your golf holidays in Praia del Rey you will probably be arriving at Lisbon Airport. Upon arrival do not catch a public transportation to Praia del Rey, you will pass all day carrying luggage and golf clubs while switching between buses and trains. This option takes forever and you will be exhausted. We advise you to book online a private Lisbon airport transfer to Praia del Rey Golf Resort. Our airport taxi transfers services is the fastest and cheapest option you will find compared to regular taxis. Select Praia del Rey as your transfer destination area and provide us with flight details, Praia del Rey accommodation address and contact. We automatically process your request for transport availability to Praia del Rey and send a booking voucher with your transfer confirmation in a matter of seconds. At Lisbon Airport arrivals terminal a friendly driver will be waiting for you next to a placard with our website logo. For the return transfer we will pick you up from the same address in Praia del Rey. And remember, you can always pay later to the driver for both your arrival and return Praia del Rey transfer. How far is Praia del Rey from Lisbon Airport? How much will it cost? How long? The travel distance between Lisbon Airport and Praia del Rey is 95Km and transfer time takes approximatly 70mins under normal traffic conditions. Providing private and direct Lisbon airport transfers to Praia del Rey Golf resort. If you want to avoid all the hassle of catching buses and trains in Lisbon to Praia del Rey carrying your luggage around and if you are not willing to wait in lines and pay for expensive normal taxi fares to Praia del Rey. Using our services a driver will meet and greet you at Lisbon Airport arrivals hall. He will assist you with all the luggage and golf clubs, guide you to your assigned transfer vehicle. In approximately 70 minutes you will be playing golf with your friends and family. Welcome to Portugal! Praia del Rey is the perfect combination between sand dunes, beaches and golf with a relax atmosphere. Praia del Rey Golf & Beach Resort less than one hour from Lisbon airport, set in an area of rural landscape of sand dunes, pine tree forests and the Atlantic ocean. You will be amazed by the quantity of out-door activities available. Welcome to Portugal! We are specialists in quality private transfers service at Lisbon Airport. We will transport you directly to and from any hotel, golf resort or private holiday villas / apartments in the Praia del Rey area: Golf & Beach Resort, Holiday Residence Praia del Rey. Use our website to pre-book your airport taxi transfer from Lisbon airport to your accommodation.